Gene flow between species has played a prominent role throughout the evolutionary history of Darwin’s finches. 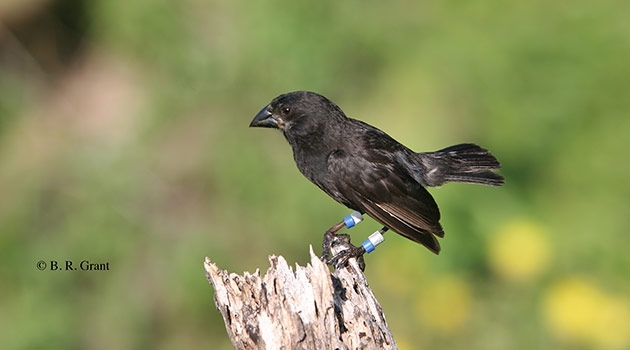 A team of scientists from Uppsala University and Princeton University has now shed light on the evolutionary history of Darwin’s finches and have identified a gene that explains variation in beak shape within and among species. The study is published today in Nature, on the day before the 206th anniversary of the birth of Charles Darwin. Darwin’s finches are a classical example of an adaptive radiation. Their common ancestor arrived on the Galapagos about two million years ago. During the time that has passed Darwin’s finches have evolved into 15 recognized species differing in body size, beak shape, song and feeding behaviour. Changes in the size and form of the beak have enabled different species to utilize different food resources such us insects, seeds, nectar from cactus flowers as well as blood from iguanas, all driven by Darwinian selection. One important insight was that gene flow between species has played a prominent role throughout the evolutionary history of Darwin’s finches. The scientists could even trace clear signs of hybridization between a warbler finch and the common ancestor of tree and ground finches that must have occurred about a million year ago. ‘During our field work on the Galapagos we have observed many examples of hybridization between species of Darwin’s finches but the long-term evolutionary effects of these hybridizations have been unknown’, say Peter and Rosemary Grant, Princeton University, who know more about the biology of Darwin’s finches than anyone else in the world after carrying out field work on the Galapagos during a 40 year period. ‘Now we can safely conclude that interspecies hybridization has played a critical role in the evolution of the finches, and has contributed to maintaining their genetic diversity’, says Peter Grant. The most striking phenotypic diversity among Darwin’s finches is the variation in the size and shape of the beaks. Charles Darwin was struck by this biological diversity, and compared it with the variety he was accustomed to among European birds such as the hawfinch, the chaffinch and warblers, as documented in his book ‘The Voyage of The Beagle’. The team investigated the genetic basis for variation in beak shape by comparing two species with blunt beaks and two species with pointed beaks. Fifteen regions of the genome stood out as being very different in this contrast, and as many as six of these contained genes that previously have been associated with craniofacial and/or beak development. ‘The most exciting and significant finding was that genetic variation in the ALX1 gene is associated with variation in beak shape not only between species of Darwin’s finches but also among individuals of one of them, the medium ground finch’, explains Leif Andersson, Uppsala University, Swedish University of Agricultural Sciences and Texas A&M University, who led the study. The ALX1 gene codes for a transcription factor with a crucial role for normal craniofacial development in vertebrates, and mutations that inactivate this gene cause severe birth defects including frontonasal dysplasia in humans. ‘This is an interesting example where mild mutations in a gene that is critical for normal development leads to phenotypic evolution’, comments Leif Andersson. ‘I would not be surprised if it turns out that mutations with minor or minute effects on ALX1 function or expression contribute to the bewildering facial diversity among humans’, says Leif Andersson.